The 5th annual Portland Beer week is coming up quickly and takes place over 11 days, from June 11th-21st. 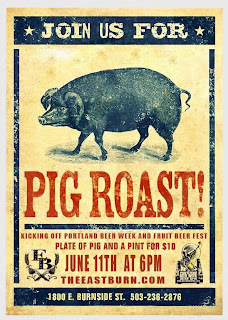 This years Portland Beer Week has just about everything PDX beer related you could want....Fruit Beer Fest, Rye Beer Fest, Beer & Cheese Fest, Block Party, Pig Roast.....you get the idea. Check the details/events below for this years Portland Beer Week. The 5th annual Portland Beer Week is presented by Whole Foods Market, Columbia Distributing, Curb and Portland Mercury with this years 11 day celebration taking place June 11-21st, 2015 with events city-wide. Highlights include an official beer by Breakside Brewery & Fremont Brewing and extends outside of beer to a sandwich special from Bunk Sandwiches, beer ice cream from Salt & Straw. Attendees also get a free coupon credit for $15 towards your Curb taxi app rides during Portland Beer Week. 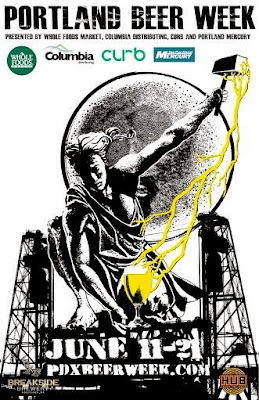 Returning this year are classics like the Portland Fruit Beer Festival, Rye Beer Fest, Sour and Barrel-Aged Beer Seminars and the Portland Beer and Cheese Fest. Some of the new events worth looking forward to are the Whole Foods Pearl Block Party on Saturday June 20th and the combined Fruit Beer Fest and Beer Week Kickoff Party & Pig Roast on June 11th! 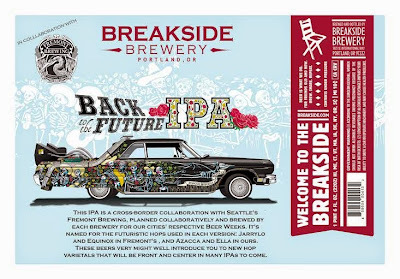 Introducing the 2015 Portland Beer Week collaboration beer "Back to the Future IPA" a multi-city beer week and brewery project between Seattle's Fremont Brewing Co. and Portland's Breakside Brewery. Check the calendar for bottle release parties and tappings of this highly limited edition beer. This IPA is a cross-border collaboration with Seattle's Fremont Brewing. We planned the beer together and each brewed a batch of it for our cities' respective Beer Weeks. When we set out to do this beer together, we knew that we wanted to make a big IPA and showcase some fun hop varietals that don't get much attention...yet. Bunk Sandwiches has honored us with an official Portland Beer Week Sandwich available at Bunk Bar SE Water and a special Queso available only at Bunk Bar Wonder, both for the entirety of the beer week June 11-21, 2015. Salt & Straw Ice Cream, our long time collaborators and partners once again grace us with a brand new Beer Ice Cream flavor this year made with an all-Citra hopped new IPA from Breakside Brewery and specked with actual Citra hop flakes. Available at special Portland Beer Week parties only. Bar Vivant/Pix Patisserie opens their brand new Beer & Cider Garden just in time for early summer drinking and is our featured outdoor drinking spot. 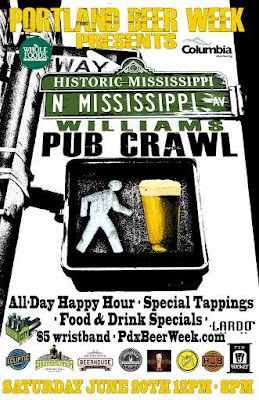 Throughout the week Pix & Bar Vivant will be offering free beers to Fruit Beer Fest attendees, featured brewer, beer and cider tappings, a pFriem tap takeover and week-long pFriem Beer Floats! Back for it’s 2nd year the popular N. Mississippi and Williams Pub Crawl promises a day full of day and evening drinking with guaranteed discounts, special drinks, rare beer tappings and food at 9 locations along Mississippi and Williams with more venues and specials still being added. Pick up a wristband for $5 at any participating location beginning May 7th or order in advance to be mailed to you (minimum 2 wristbands for mail order). Guaranteed $1 off drinks at every location from Noon to 8pm on Saturday June 20th. 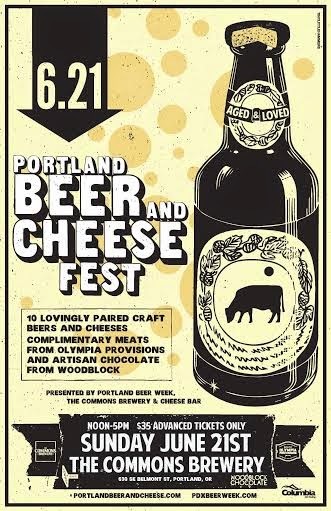 The 4th annual Portland Beer and Cheese Festival returns to The Commons Brewery and their wonderful new space on 7th and East Belmont. Sample 10 lovingly paired craft beers and cheeses by Steve Jones of Cheese Bar and 10 different breweries. Enjoy complimentary free charcuterie from Olympia Provisions. And new this year we will have complimentary chocolate from local makers Woodblock Chocolate. Tickets are on sale now for this great 21+ Father’s Day event. Each ticket gets you a punch card for all 10 beer and cheese pairings, a 4oz pour of each beer and 1-2oz slice of each cheese, also a collectible branded glass and complimentary charcuterie and chocolate while it lasts. Warning, this event usually sells out in advance so get your tickets now here. Check back in June for the full beer and brewery list.